Yeah, you love Sonic, OK? We all do. But there's a point where you can love Sonic too much. Enjoying Sonic making out with human chicks, for example, is enjoying Sonic too much. 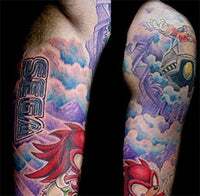 As is walking into a tattoo parlour, sitting down, saying "cover the arm with Sonic, Tails, Knuckles and a Sega logo, will you?" and thinking it's a good idea.